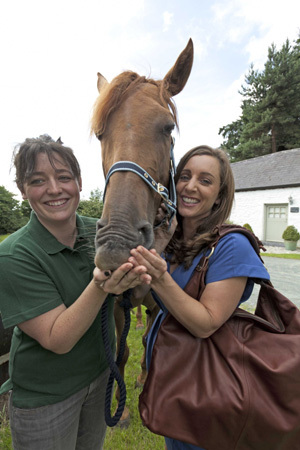 Sinead Desmond of Ireland AM, who is supporting the handbag launch with Louise O’Leary of Louloubelle Bags and Hazel her rescue horse after whom the bag is named. Louloubelle Bags, owned by Irish handbag designer Louise O’Leary, today announced that they will donate one hundred specially designed handbags to the Irish Horse Welfare Trust, with all profits of the sale of the bag going directly to the charity. The “Hazel” bag, named after Louise’s own rescue thoroughbred mare, is an exquisite soft dark brown leather bag, made in Northern Italy by an atelier who uses only ethically sourced Tuscan leather. “Having rescued horses myself, I wanted to help the Irish Horse Welfare Trust and the most obvious way for a designer to help is to design, and so I came up with the “Hazel bag”, said Louise who will donate 100% of the profits to the Trust. “During Horse Show week especially we need to be mindful of the hundreds of ill-treated and starving horses in Ireland who are unwilling victims of the downturn in the economy”. Typically retailing at €500, Louise is selling the bags for €250 with all the profits going to the Irish Horse Welfare Trust Charity. You can purchase one of Louise’s must have “Hazel bags” at the Irish Horse Welfare Trust’s stand in the RDS, or on www.louloubellebags.com, for €250. All profits go to the Irish Horse Welfare Trust www.ihwt.ie. For the month of August Louloubelle will also donate 10% profit from any bag purchased from their Autumn/Winter collection.